The field of marketing is changing rapidly, and the opportunities for aspiring marketers are limitless. 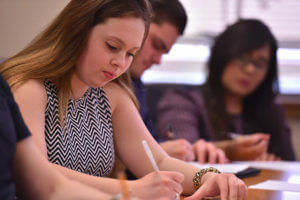 In the Marketing program at St. Mary’s University, students develop an understanding of marketing in for-profit and not-for-profit organizations. They gain strategic marketing decision making skills by learning how to evaluate and interpret the multitude of factors governing how individual and organizational consumers make decisions about product and services. The innovative curriculum includes marketing strategy development for the digitally connected world. Students learn about developing and deploying strategies across different platforms and emerging technologies to include digital, mobile and user-generated content. Students pursuing this major can choose between two marketing tracks: a Traditional Marketing Track or a Digital Marketing Track. The Traditional Track is designed for students to gain a firm foundation in traditional strategic marketing. Students learn how to apply quantitative methods to use marketing as a strategic tool to respond to marketing opportunities. The coursework involves understanding how product, promotion, pricing, distribution and service can be used to develop effective marketing strategies for a globally connected marketplace. This track prepares students for careers in marketing management, marketing research, public relations and advertising. The Digital Marketing Track offers a focused approach to developing and using specific tools and skills needed to effectively evaluate and interpret data metrics, create digital strategies, and optimize the latest tools for digital content creation for marketing purposes. This track prepares students to become innovative digital marketers with the skills needed for a career in marketing analytics/strategy, graphic/multi-media design, and mobile/social media marketing. The Greehey School of Business also offers a minor in Marketing specifically for non-business majors at St. Mary’s. Students enrolled in the Marketing minor will learn the foundational principles of marketing and learn the strategic dimensions of using marketing as a tool to understand how to better respond to the needs of individual and organizational consumers. They will learn how to use product, pricing, promotion, distribution and service to better serve customers across all sectors of the economy. The Digital Marketing minor will provide students with a strong foundation in the fast-paced and growing field of digital marketing. Students will gain insights into marketing analytics, communication and marketing strategy, and new media creation. In doing so, students will learn to effectively interpret data, create innovative marketing strategies, and create impactful digital content.